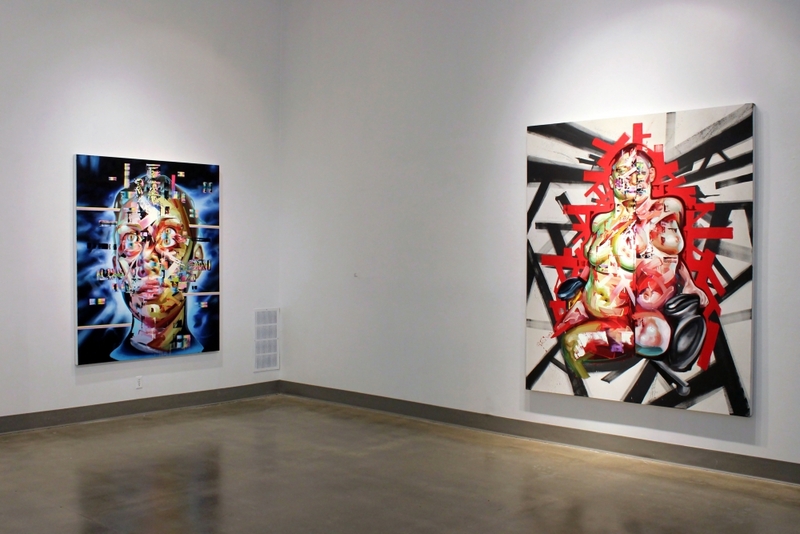 UNIX Gallery would like to refresh your memory that Kellogg University Art Gallery at Cal Poly Pomona has its show, "About Face" on view through April 27th. "About Face" includes some extraordinary pieces by Justin Bower along with a few other artists who redefine the construct of portaiture. Justin Bower’s monumental “Moment Of Collision” (2013, oil on canvas) is a larger than life portrait of a digitally deconstructed female cyborg-like “person” (a sci-fi replicant?) looking straight at us. Her seeming perfection starts to shift, slide and blur as if the program designing her is having a nervous breakdown. Breathtaking in scale and showcasing the sheer virtuosity of Bower’s paint handling, it is almost a master class of twentieth and twenty first century painting styles. The hard-edged green stripes of the background echo the 1960’s, with the photorealistic eyes of the 1970’s art movement coupled with the Abstract-expressionist slashing brushstrokes hovering over the mouth and nose area. The multi-colored squeegeed abstract rectangles scattered about remind us of Gerhard Richter’s work. Conceptually cool, unemotional and almost formulaic, the paintings are all variations on the same theme, though each alone is spectacular. To find out more about how Bower uses portraiture to explore contemporary ideas regarding tehnology and the digital age, click the link below.